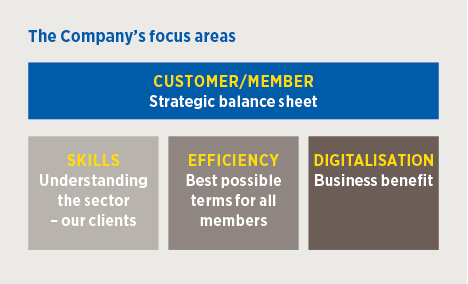 Kommuninvest’s change process is being conducted in four areas of focus: Customer/Member, Skills, Efficiency and Digitalisation. In the Customer/Member area of focus, the Company’s ambition is for the knowledge exists in the operations and the local government sector to support financial management skills among customers and members. Technical developments facilitate this being accomplished through products and services that support customers and members’ strategic efforts to achieve a balance sheet enabling financial management that is sustainable in the long term. Over the year, the use of Kommuninvest’s digital services has increased. At the end of 2018, there were 204 (182) active user agreements for the full version of KI Finans, a tool developed specifically for debt management in the local government sector. The results of the customer survey provided a strong acknowledgement of customer satisfaction. In the survey, which is conducted every two years, Kommuninvest achieved a result of 88, compared with 86 the previous survey from 2016. The highest degree of satisfaction was in the areas considered most important by customers. Over the year, Kommuninvest launched its Employee Programme in the Skills area of focus – a skills development initiative encompassing all Company employees. The goal is to create a platform for developmental dialogue, constructive feedback and personal development that will provide the conditions for more active and secure collaboration based on communication and participation. For more information on the Employee Programme. To increase the understanding of the local government sector’s needs, a survey was also conducted in 2018 based on in-depth interviews with a representative sample of Kommuninvest’s customers. The Efficiency area of focus is to provide Kommuninvest with opportunities to offer long-term competitive financing options to all members. During the year, Kommuninvest’s competitiveness was further strengthened when amended owner directives allowed significant price reductions on lending products. Projects performed to increase efficiency in internal processes have also provided conditions for clearer follow-up and a long-term sustainable cost trend. More efficient and automated management of new loans is the main thrust of the Digitisation area of focus. Over the year, new technical solutions for price information, bid requests and electronic signing of loan documents were developed and launched to customers with favourable results. The Company’s strong growth continues and total lending passed SEK 350 billion in 2018 – an average annual increase of 11 percent over the past five years. The Company’s share of the local government sector’s external funding has increased from 44 to 55 percent over the same period. In recent years, the members of the Society have capitalised the Group with the target of achieving a leverage ratio of 1.5 percent. Accordingly, the Company’s equity has risen from SEK 2.4 billion in 2014 to SEK 7.6 billion in 2018. On 31 December 2018, the leverage ratio was 1.75 percent. For multi-year data in table format, see page 93 in pdf version.